I recently completed a Master Suite project for a wonderful couple with two small boys. Their home is situated on the water’s edge with beautiful ocean views. The room is large, but wasn’t pulled together, and didn’t reflect either of their personalities or style. Armed with the objectives below & the inspiring views, I set out to transform this space! Here are the “Before” and “After” photos. It has undergone quite a transformation and the homeowners love their new space. I had an incredible time working with them on this project. I think we accomplished all we set out to do… and more! 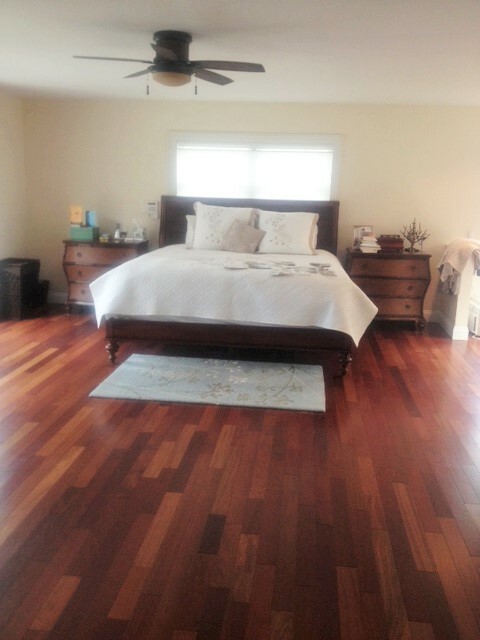 The room is spacious and has beautiful cherry floors. It was lacking lighting and color. New paint, matching glass table lamps, bold artwork, additional pillows, a few accessories and gorgeous pops of teal and green bring the space to life! The deep colors are warm and soothing and reminiscent of the ever-changing ocean colors. Everyday items needed a better place to live. 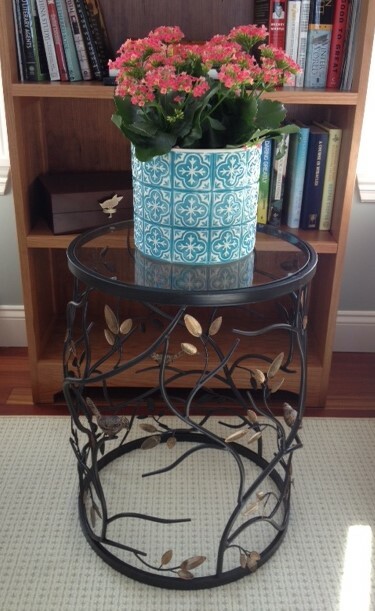 We purchased a jewelry armoire for another corner of the room and found a new home for photos and books. Again, lighting makes a huge difference! Never underestimate how important it is to your rooms. A few accessories bring in the birds, while the clock adds function. This space was just waiting to be used. It received a lot of attention to create the cozy space the homeowners wanted. I painted this wall a different color to further accent the separation of space. 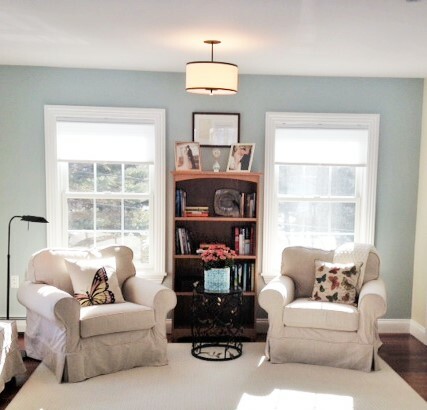 A custom, cherry bookcase made by Tim Hill Fine Woodworking perfectly fills the space between the windows and resolve the need for book storage. 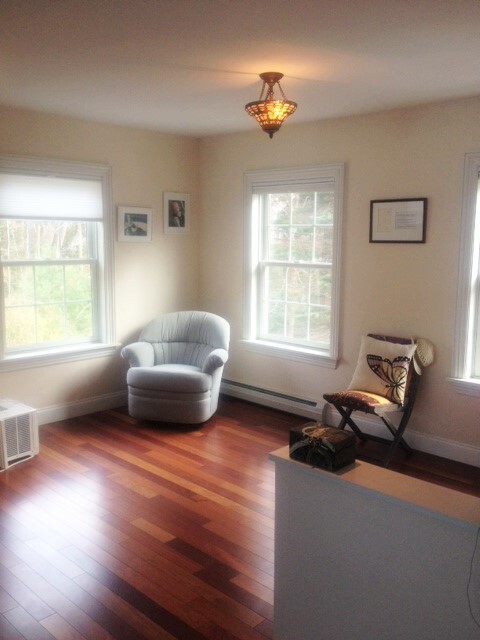 New slip-covered chairs, ottoman, ceiling fixture, table, reading light, pillows, throw and custom rug ground the space. Adding existing framed photos makes it personal and familiar. It’s just inviting the homeowners to come, sit and relax!! The ceiling light is even set on a dimmer for relaxing evenings taking in the ocean view. 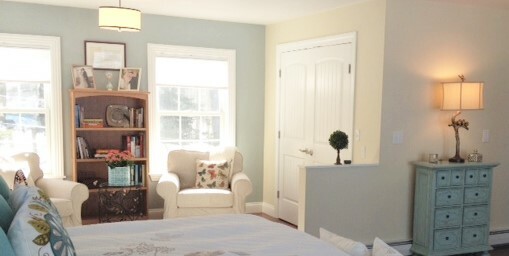 I hope you enjoyed seeing this Master Bedroom transformation as much as I enjoyed working on it! Please feel free to contact me with any questions or comments. Remember, whatever you space or project, always Design*Decorate*Delight in the process! 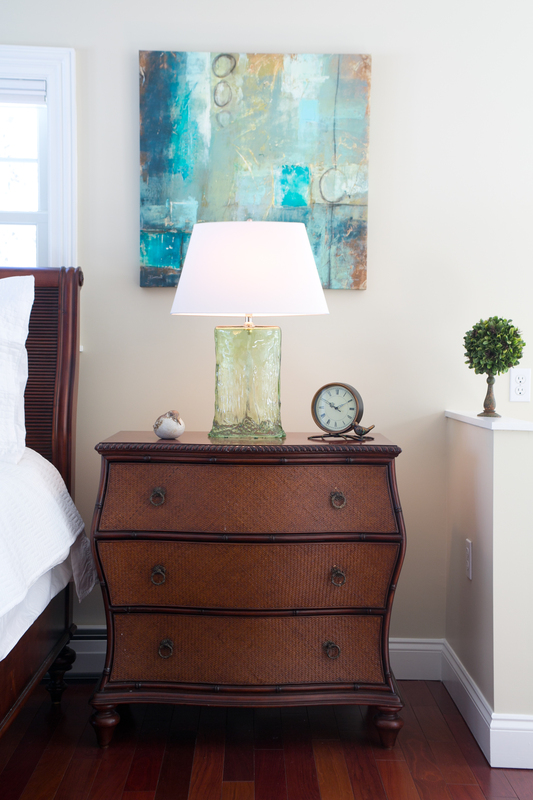 Gallery | This entry was posted in Events, Master Bedroom. Bookmark the permalink. Hi Lisa, I’ve been having the worst time picking bedroom furniture. This picture is exactly what I want. 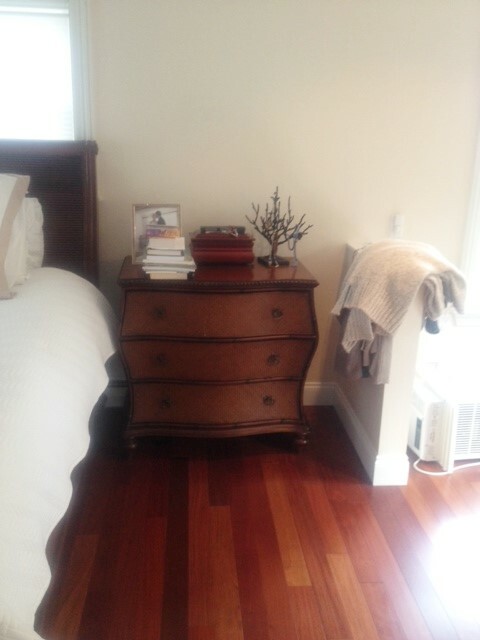 Can you tell me where I can find this bedroom set. I would love if you can help with my room as well. I’m a little far San Diego. Hello Heather! Thanks for stopping by. I’m glad you like the room – it was a great project. I didn’t purchase the bedroom furniture, it already belonged to the clients. I will contact them to get any information I can for you. Let me know if you have any more questions! Great transformation! I really love the entire changes. You can see the big difference when you compared it from the previous one. One thing that caught my attention is the painting, it is brilliantly made to fit with the style of the bedroom. Your style is really unique compare to other people I’ve read stuff from. Love the transformation! Also love their bedroom furniture. Did you ever find out a source for the furniture? Thank you Nina! I’m so glad you like it. The clients already owned this furniture, but I have found out that it was purchased from Ethan Allen. They could not recall the name of the particular collection. Perhaps someone at Ethan Allen would recognize the collection and let you know if it’s still available.